Once you learn the basic principles behind installing tile you can apply them to any number of projects– floors, walls, countertops, tabletops, and about anything else you can think of. I recently spent a day installing 1677 itty-bitty tiles on the wall of a urinal stall and there’s an item that wouldn’t have gotten crossed off my Bucket List if I wasn’t confident in my ability to slap some glue on a wall, stick some tiles up there, and smush a bit of mud between them. What can I say? It’s a technical process. If you’re already going blah, blah, blah, just tell me how to get this tile on my floor without the universe imploding then you can skip right to any of these step-by-step tutorials. If you want to gain a little better understanding of the tools, materials, and process involved in tiling before diving in to specific projects, read on. All tiling is essentially the same, though there are different products and techniques used to achieve different looks. 1.) Surface – This is where it starts… horizontal, vertical, permanent, moveable, other than a ceiling (which I’ve never attempted) you can stick tile to almost anything. 2.) 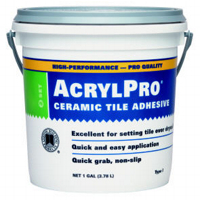 Glue – something must be used to adhere the tile to your surface. Occasionally called thinset mortar, mastic, or tile adhesive, these are all different products used in different applications that essentially do the same thing: stick stuff to other stuff. 3.) Tile – this is the fun part. You can use big tiles, tiny tiles, glass tiles, stone tiles, ceramic tiles, broken tiles, and even old china-ware if it suits your fancy. The tile you use will often dictate what other tools and materials you will need to finish the job. 4.) Grout – affectionately referred to here as “mud” because hey, it’s dirt and water, why fancy it up? Actually, sometimes there isn’t even any sand in it, so I should probably use the technical terminology. Again, there are infinite colors and types of mortar, and some are better than others in a specific application. 5.) 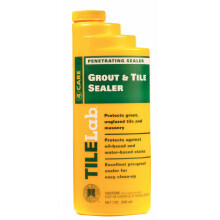 Sealers- The unsung heroes of tiling, if you’re using any type of natural stone you’ll want to seal your tile, and you will always want to seal sanded grout. Based on your materials the type of sealer will change. So mud, tile, glue, and something to stick it all to… ready? Go tile! What? You need more info? Internet, you are so demanding. I don’t know why I stay in this relationship. Before I go on, here’s a caveat: I am not a professional tiler. Tiler? Tile installer? Tile installation professional? See? I don’t even know the proper terminology for a person who installs tile and gets paid for it. On the other hand, it’s somewhat likely I know what the hell I’m talking about because I’ve been tiling every horizontal and vertical surface in my life for the last five years. Nothing has spontaneously combusted yet. Let’s work from the ground up. 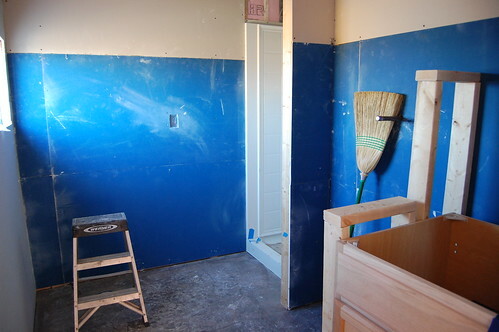 In nearly any application you’re going to want to put tile backer-board down first. (Exception: Concrete floor.) Here’s why… it keeps the expansion and contraction of your wood sub-surface from ruining your grout. Backer board is generally fiber-cement, and comes in a variety of thicknesses. I’ve most often used 1/4″ for flooring, but have also been known to use 1/2″ on the lower half of walls to make it flush with drywall. It goes down first with a layer of “thinset” (read: adhesive… we’ll get there in a minute), then is screwed into place, and the joints should be taped and mudded, similar to drywall. Good news, no sanding. For more detailed instructions on installing backerboard, check out these instructions from Hardibacker. Thinset – Also called mortar, it’s a mix of cement, water, and fine sand. It comes pre-mixed or in a “just add water” bag. This is best used in commercial applications, “wet wall” applications– like a shower floor, or with heavier tiling materials. Mastic – Is an acrylic adhesive. 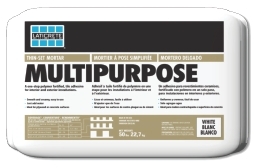 It’s okay to use this for floor tile in residential applications, but be sure to read the label because different types of mastic are needed to accommodate different (particularly larger) tiles. Also, some mastic is okay for walls that are “intermittently” wet, but it doesn’t hold up as well to water as a thinset does. On the other hand, it’s more glue-like a better for wall applications, or adhering tile to gypsym wallboard (drywall). Mastic almost always comes pre-mixed. Ceramic – Ceramic tiles are easily the most common. They come in a number of sizes and finishes. For floors 12×12 or 16×16 are the most common tile sizes, though you shouldn’t let that limit you. I tiled my bathroom floor in 2×4″ tiles laid in a brickwork pattern. For walls you can find anything from a 6×6 tile to a .5x.5 mosaic. Ceramic is great for cutting and clean-up and you can usually find an inexpensive ceramic option. Stone– Slate, Marble, Granite, and even river-rock pebbles are used to create stone tile. It has advantages ( looks awesome) and disadvantages (costs more). Natural stone tile may be heavier than ceramic, and options like slate are soft and can be difficult to work with. Glass– Glass is most often found in smaller tiles, such as mosaics. It’s an expensive option with a 12×12 mosaic sheet selling for anywhere from $7-$20/sq. ft. (Whereas ceramic can often be found for $1-$5/sq. ft.) Another interesting property of glass tile is that often you can see through it, so it requires a little more preparation of the surface you’re working on as well. Metal– Hey, they’ll make tile out of almost anything these days. Again this is most often seen in smaller tiles and mosaics. The tile is adhered to the ground using adhesive. That’s a bit of a “duh” statement, but I thought I ought to throw it in there for good measure. Grout fills the spaces between the tile and keeps any moisture away from the adhesive holding your tile to whatever it’s stuck too. Hopefully not your boyfriends forehead. There are also fancy epoxy and resin grouts, but they’re not used often in residential applications. And really, why make things more difficult than they are already? Sidenote: For a good chunk of my formative years my family owned a concrete company. 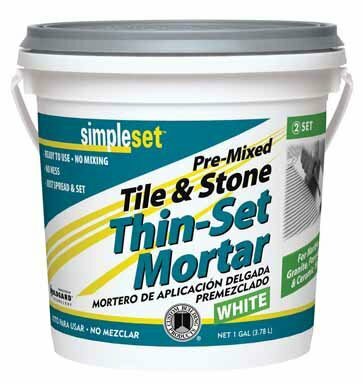 Whenever I’d call in to talk to my Dad, I’d be stuck on hold listening to their pretaped message that went something like this “The terms mortar and grout are often used interchangeably, but they are not. Grout is pourable, mortar is not.” And finally that bit of useless trivia that has been floating around in my brain for the last 20 years has a purpose. There are some basic compositional differences between grout and mortar (the addition of lime, for example) but really it’s just a matter of more water. Sealing grout (and tile) is an important step. One I often leave out because I’m on to the next project thankyouverymuch. Also, the tile aisle at the big-box stores is crammed full of sealers and it’s a little intimidating. Here’s the deal: Sealing grout helps it from getting stained, and keeps the moisture out. Sealing natural stone that is more porous than ceramic tile serves the same purpose, and it also gives everything a more “polished” look. An all-purpose grout and tile sealer should be good for general applications, but again, make sure it’s compatible with your material types. Stone like slate or marble will likely require something more specialized. Particularly if you want a little sheen. The fun ain’t over yet. Choosing the right materials for your project is only half the battle. The other half (and the slightly more fun half, if you ask me) is having the tools to do the job right. 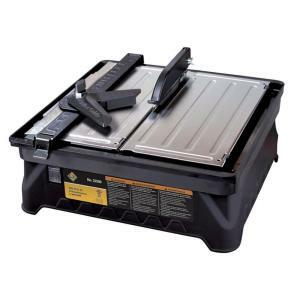 Score-and-snap tile cutter (for larger tiles) – This is a cheaper alternative to a wet-saw, used to cut your tile down to size. 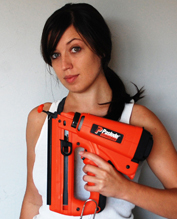 Drill – For installing backer-board. 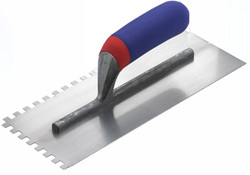 Notched trowel- For spreading adhesive. The size of the notches corresponds to the size of your tile and how much adhesive you need. I most often use 1/4″ for regular floor applications, and 1/8″ for small tiles — like glass mosaic tiles. 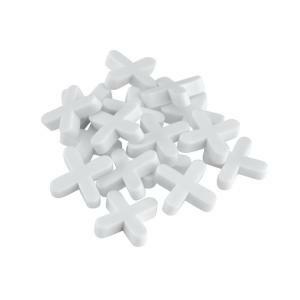 Spacers – For spacing tile to get consistent grout lines. 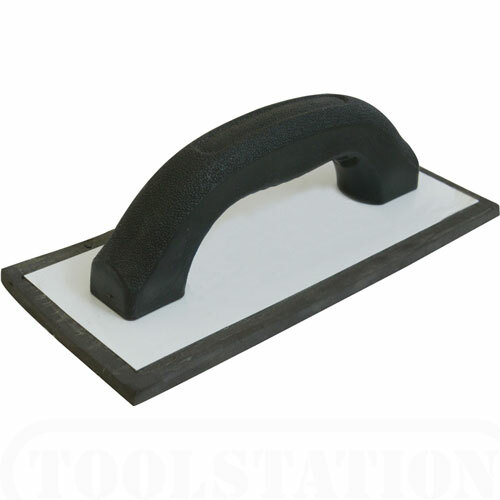 Grout float – For smushing grout in-between the tiles. Sponge – For wiping away excess grouts. Buckets – To use as a helmet. Okay, just kidding on that one. You’ll need at least one to hold water while rinsing off the grout. Maybe two, if you’re mixing your own grout or thinset as well. Gloves – Your fingers will thank you later. 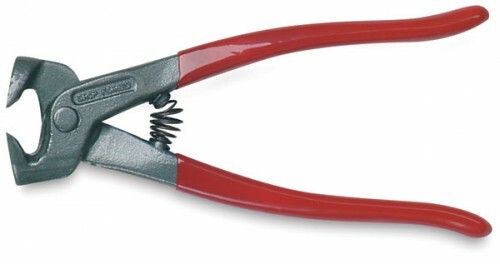 Other Tools – Not a necessary, but fun to have. 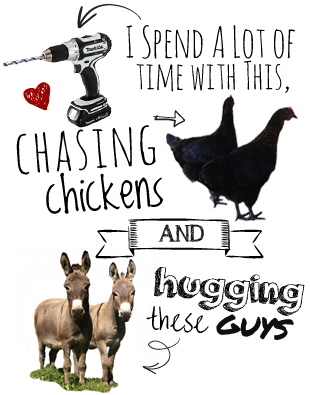 And really, isn’t that the case with most tools? Wet Saw – For precise cutting of any size tile. Except for those itty bitty ones – it is still a saw, and I’ve heard you can lose a finger. 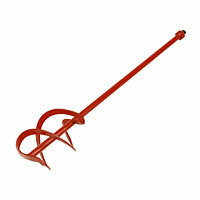 Grout mixing drill attachment – Come on, it’s just fun to use. Also, make sure you have the proper PPE (Personal Protective Equipment) when cutting tile with anything. i.e. Wear safety glasses or they’ll be digging tile shards out of your eyeball and that will ruin the party. Okay, here’s the really high-level overview, but I’m telling you the step-by-step tutorials have pictures and everything, so go there next. 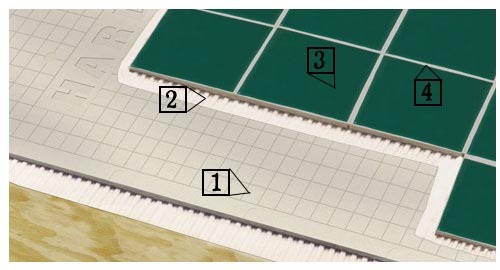 Layout your tile before you start getting all glue-happy. Tile should always be centered in the middle of a room (don’t just start at one end and work towards the other, it will look lopsided). You can pre-cut pieces, or lay your whole tiles first and do the cut tiles later. Up to you. I do it both ways, and the world has yet to implode, so it must be ok.
Start laying your tiles by spreading adhesive with the notched trowel. Push tile into adhesive and jiggle it a bit for a good set. Use spacers to properly align them. Once your tile is down, let it dry for 24-ish hours before grouting. Use a grout float to get the grout in all the cracks. Remove excess grout with sponge. Let set for 30 minutes and wipe it down again. Then let it dry overnight and wipe everything down with a soft dry cloth the next day to remove grout haze. Tip: For large grout lines (more than 1/2″) misting the grout with water every hour or two will help reduce shrinkage cracks. Seal. Seal. Seal. Seal. Seal. Do not start your next project. Do not belly-slide across your new tile surface. Pick up that sealer and get back to work. Now you can belly-slide across your new tile surface. Now get to it. Make sure to leave a comment if you have a good tiling tip, or a question I can help answer. Question: Does grout come out of your hair? Answer: Eventually. Probably. Um… come back in a month and let’s talk. This is the best description of procedure I have read!!!!! With all that said, I just wanted to say thank you for the intel. You cleared up a few mysteries that 4 hours of searching on the net failed to clear up. soo THANK YOU! I have glass tiles that I want to remove the back off of. Not just the mesh stuff but there is some kind of white backing on it as well. I want to be able to see through the glass. Any ideas on how to remove it? of marble color and texture to choose. Locating in the biggest marble import and exporter center of Shuitou enable us to find various marble block and slabs for the cut to size production. marble column, marble balustrade and marble medallion etc. single row black glass tile in stalled. no drying time was allowed.black unsanded grout added to tile. result when finished, white lines showed through grout lines. why the white lines. please give me an answer please! There are a lot of possibilities – With a grout that includes portand cement (usually sanded) white or splotchy grout may be from efflorescence, usually due to moisture content of grout. If it’s unsanded grout I’m not sure what’s happening in your particular situation. Second, I have a slight problem because none of the information that I have found on the Net has addressed the issue that I am concerned with. Third, the issue: Installing a variety of artistic tiles of various thicknesses and sizes. Fourth, I am applying the tiles to drywall that has been painted and sanded. Water seepage is not an issue. Fifth, I read somewhere that you can butter the backs of the tiles and just stick them on and that is what I would prefer to do. After the tiles are stuck onto the prepared drywall I intend to follow the grouting and sealing process you have described here. Even though the drywall has been painted I might suggest a tile membrane (something like this) before you tile. Even any adhesive you use will have some moisture in it, and drywall doesn’t hold up well to that, particularly when it’s holding the “weight” of the tiles. As far as buttering the back of tiles and sticking them on, yes, you can totally do that. From all the pros I’ve seen do this, I would recommend a layer of thinset/mastic on the wall first, and then also butter the back of the tiles. (Work in small sections because it takes much longer this way!) It’s better for good adhesion. Good luck with your project! I live in oregon where it RAINs. We have a small space between our patio and our chicken cage. I am tired of walking through the deep mud *( you sink in by about 4″. I was at a garage sale yesterday and got some big kitchen floor tiles ( about 12″ by 12″) Is there a way to put them outside in themud without them breaking? Hi Carolyn – I’m assuming your weather in Oregon is similar to mine in Michigan. Any indoor/ceramic tile probably won’t make it through the winter because of the moisture/freezing. Concrete pavers are probably the best way to go! For grouting, you just need grout and a grout float (used to push the grout into all of the cracks) and a bucket of water and sponge for cleaning excess grout away. back to read a great deal more, Please do keep up the superb work. What are your thoughts on tiling over tile on the floor? Ground floor condo, on a cement pad. The floor is tiled (probably in the 70s) with standard four inch tiles that are normally used on shower walls. The tile is actually in good condition, but it’s dated and I don’t know if I can get all the stains off. 1. How would I remove the existing floor tile? 2. Or, is it okay to tile right over what’s there and what kind of prep would you suggest? Trackback from BOLD Moves Real Estate | DIY Home Improvement- Tile!